James Cook was born on 27th October 1728 in Marton, now part of Middlesbrough. His father, James, was originally from Scotland, and had married Grace Pace from Thornaby on Tees. He was an agricultural labourer and moved about the area to find work on local estate farms. 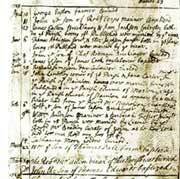 Within a week of his birth James was baptised in the parish church of St. Cuthbert, Marton, on 3rd November 1728. 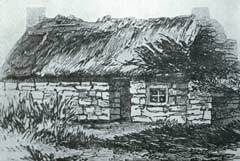 Early 19th century artists’ reconstructions of the birthplace cottage show it as a stone-built single-storey thatched building, typical of the small labourers’ cottages of the 18th century. 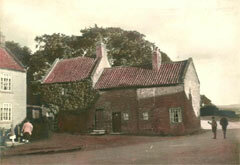 The cottage stood in East Marton, close to the site of the later Marton Lodge and Hall. By the second half of the 1780s it had fallen into disrepair and was dismantled. The birthplace cottage was probably too temporary and insignificant a building to have been marked on any maps of the area. 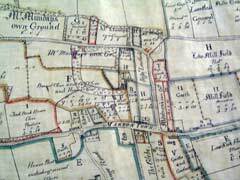 James Cook senior worked for a farmer Mr. George Mewburn who owned the land and properties marked G on the 1764 Marton Estate Map. This map does not show the cottage as it was probably located outside the main area of survey on land belonging to a Mr. Munday. This was on the other side of Marton Back Lane, the main route through the village, opposite Mr. Mewburn’s garth and orchard, and to the south of the later Marton Lodge (1786). The Cook family moved between Marton and neighbouring Ormesby more than once, no doubt in attempts to find better work and housing. During this time the young Cook would have helped with the work and even received some basic schooling. By 1736, when James was eight years old, his father had got the job of hind or foreman at Aireyholme Farm near Great Ayton, about six miles away. 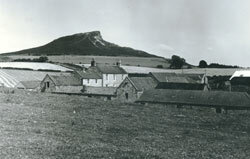 The farm stood on the lower slopes of Roseberry Topping and was owned by Mr. Thomas Scottowe, Lord of the Manor of Great Ayton. The family left Marton and probably moved into an estate cottage attached to the farm. 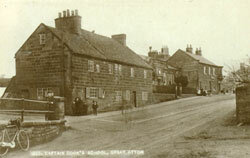 During the next eight years James attended the local school and when he left went to work on the farm at Great Ayton. The school that James attended had been set up by a local yeoman, Michael Postgate, in 1704. It is possible that Thomas Scottowe, James’s father’s employer, financially supported James’s schooling there. James, along with the other twenty to thirty other children, would have been taught writing and arithmetic and received religious instruction, probably until the age of twelve. In 1785 the original school building was rebuilt. It now houses the Captain Cook Schoolroom Museum. James Cook left Great Ayton for Staithes in early 1745 and in 1755 his father retired from the farm and moved with his family into a house which he had built in the village of Great Ayton. Captain Cook never lived in this cottage but would have stayed here when visiting his parents. This building is now a museum in Australia. In early 1745 Cook went to work for William Sanderson, merchant, haberdasher and grocer of Staithes. There Cook would have experienced for the first time life in a small but busy fishing village. 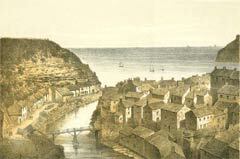 He soon decided to move to Whitby to embark on a seafaring life and left Staithes mid-1746. Sanderson’s small shop was located on the seafront but was either dismantled or washed away in a storm in the early 19th century. Most of the building materials were re-used to construct new premises that can still be seen on Church Street. 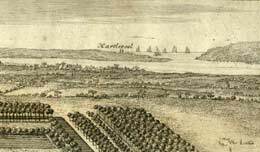 In 1746 James became apprentice to John Walker, a Whitby ship owner whose collier cats or barks transported coal between Newcastle and London, a round trip of about four weeks. Cook sailed on various vessels, including “Freelove”; “Three Brothers”, which saw Cook released from his apprenticeship (1749); “The Mary of Whitby”; and “Friendship”, of which he became Mate (1752). 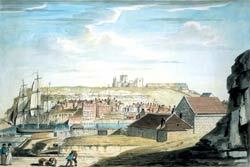 During winter months outside of the sailing season ships were overwintered at Whitby. Repairs were carried out to vessels and Cook, like the other apprentices, lodged at Mr. Walker’s house in Grape Lane. During these periods Cook appears to have studied hard and by 1755 he had the chance to become Master of the “Friendship”, deciding instead to join the Royal Navy.